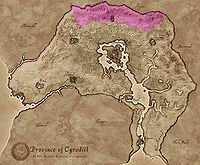 The largest town in the Cyrodilic part of the Jerall Mountains is Bruma, which is connected to the rest of Cyrodiil via the Silver Road and Orange Road. The forests of the High Jeralls provide wood for the region. Dive Rock and Gnoll Mountain are among the few named peaks in the region. Other settlements include Applewatch, Cloud Ruler Temple, Frostcrag Spire, Lord Rugdumph's Estate, and the Temple of the Ancestor Moth. 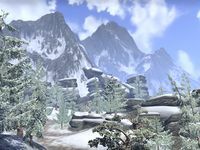 Shrines to Azura, Hermaeus Mora and Namira are located high up in the mountains, away from scrutinizing eyes. The mountains border the Skyrim hold of Falkreath to the north and the Rift to the northeast. Its harsh, cold climate has made the mountains nearly inhospitable, with few if any inhabitants living there and no major settlements throughout history. 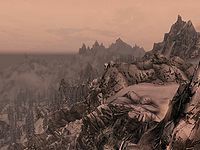 Some points of interest include Fort Neugrad, the dragon shrines of Ancient's Ascent and Lost Tongue Overlook, the Dwemer ruins of Rkund, or the large Nordic ruin of Arcwind Point. In the easternmost part, where the mountain range meets Velothi and Valus Mountains, the volcanic peak of Trolhetta can be found.